If you are interested in attending you must RSVP to CatalinaCruzNY@gmail.com, 347 460 4486. Hope to see you all there! Performing Arts Conservatory of New York proudly presents our second day of performances during the Winter Season of 2018. This concert will take place at the Renaissance Charter School in Jackson Heights, Saturday, December 15th, 2018. We look forward to seeing you all there and to presenting the work of our students and teachers! This project is made possible with funds from the Decentralization Program, a regrant program of the New York State Council on the Arts with the support of Governor Andrew Cuomo and the New York State Legislature and administered by the Queens Council on the Arts. Performing Arts Conservatory of New York invites students of the Music, Art and Dance Programs to participate in its 2018 Autumn Festival Concerts. Students are encouraged to practice in order to present a professional performance and may wear Halloween costumes if they wish. Students will be informed about their schedule to perform. There is a donation of $50 per performer. If there are two or more performers of the same family, the donation will be $75. Parents, grandparents, family members, friends and the community of Jackson Heights are all invited to enjoy our colorful performances full of imagination and wonderful music at no charge. Through these events we can observe the progress our kids are making in their journey towards mastery. Contributions will help to cover the expenses of the concerts and to sustain the Conservatory’s mission of providing music and arts education to our kids. Donations must be paid before October 21st. If you have any questions, please call (718) 639-1425 or (917) 774-3411. Performing Arts Conservatory of New York (PACONY) is celebrating our International Summer Concert 2018 with a recital that will allow our students to perform in the beautiful Christ & St. Stephen’s Church in Manhattan. All students from the Music and Dance programs are invited to participate in the recital in order to have their dedication and progress recognized and to promote music and art in our community. In order to pay the expenses of the recital (space rental, programs, diplomas, flowers, etc.) and to support PACONY’s mission to continue offering music and arts education, the ticket price for each audience/family member will be $25. All ticket purchases must be made in person at the Conservatory before August 19th. There is no fee for student performers and children six and under may attend free. We strongly encourage all students to participate in these events which help develop musicality and confidence. Students will be informed about their specific program time in advance. All students will receive a certificate in appreciation of their performance. If you have any questions, please contact us here or by visiting us in person at the Conservatory. Performing Arts Conservatory of New York is beginning the summer with a recital that will allow our students to perform in the very special and prestigious Kosciuszko Foundation Recital Hall in Manhattan. All students from the Music and Dance programs are invited to participate in the recital in order to have their dedication and progress recognized and to promote music and art in our community. In order to pay the expenses of the recital (space rental, programs, diplomas, flowers, etc.) and to support PACONY’s mission to continue offering music and arts education, all student performers and audience/family members will each make a contribution of $20. All contributions must be made in person at the Conservatory before June 17th. We strongly encourage all students to participate in these musical events which help develop musicality and confidence. Students will be informed about their specific program time in advance. All students will receive a certificate in appreciation of their performance. Performing Arts Conservatory of New York proudly presents our Spring Concerts 2018. The concerts will take place at the Renaissance Charter School in Jackson Heights, Sunday, April 22nd, 2018. We look forward to seeing you all there and to presenting the work of our students and teachers! Performing Arts Conservatory of New York invites students to participate in its 2018 Saint Valentine’s Concert celebrating PACONY being voted the Best Music School in Queens for the second year in a row (2017 & 2018 in the Queens Courier!). Students will be informed about their schedule to perform. Tickets for parents, family members, friends, and the general public are $25 each and are available at the Conservatory; in addition each student will contribute $5 for participating. Contributions will help to cover the expenses of the concerts and to sustain the Conservatory’s mission of providing music and arts education to our kids. If you have any questions, please call (917) 774-3411. Click here to view and download pictures from the concert! 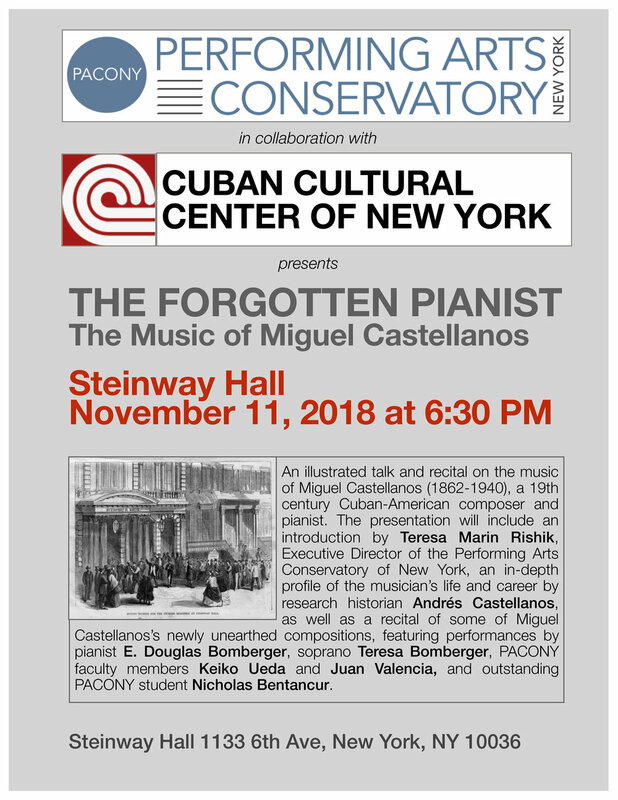 Performing Arts Conservatory of New York is inviting you to our special 2017 Winter Steinway Hall Concert in which advanced students and faculty of the Music Programs will perform. December 17th marks the 24th anniversary of our dear director Teresa’s arrival in the United States from Spain. We are taking this opportunity to celebrate her presence, monumental hard work, and kindness in making the Conservatory what it is today. It would not exist without her! Your support will help cover the expenses of the concerts and sustain the Conservatory’s mission of teaching Music, Dance and Art. Tickets must be purchased for $15 in advance at the Conservatory. No tickets will be sold on the evening of the concert. If you have any questions, please call us at (718) 639-1425 or (917) 774-3411. There will be a reception afterwards. Performing Arts Conservatory of New York proudly presents our Winter Concerts 2017. The concerts will take place at the Renaissance Charter School in Jackson Heights, Sunday, December 10th, 2017. We look forward to seeing you all there and to presenting the work of our students and teachers! Performing Arts Conservatory of New York proudly presents the Autumn Festival Concerts 2017. The concerts will take place at the Renaissance Charter School in Jackson Heights, Sunday, October 29th, 2017. We look forward to seeing you all there and to presenting the work of our students and teachers! Performing Arts Conservatory of New York is celebrating our Summer Program 2017 with a recital that will allow our students to perform in the very special and prestigious Kosciuszko Foundation Recital Hall in Manhattan. In order to pay the expenses of the recital (space rental, programs, diplomas, flowers, etc.) and to support PACONY’s mission to continue offering music and arts education, all student performers and audience/family members will each make a contribution of $20. All contributions must be made in person at the Conservatory before August 22. Come hear our students perform their latest repertoire! We thank you in advance for the contributions that make these concerts possible! Performing Arts Conservatory of New York proudly presents the Saint Valentine's Concerts 2017. The concerts will take place at the Unity Center of New York City, Sunday, February 12th, 2017. Come see the progress the kids are making! We thank you in advance for the contributions that make these concerts possible. We invite parents, grandparents, friends, family members, and guests to enjoy the musical events at $25 per ticket. You can purchase tickets at school but they will also be available at the door. There are no fees for performers in this concert. Supplemental donations also will be greatly appreciated and will help sustain programs at PACONY. Performing Arts Conservatory of New York proudly presents the Winter Concerts 2016. The concerts will take place at the Jewish Center of Jackson Heights, Saturday, December 17th, 2016. We look forward to seeing you all there and to presenting the musical progress the kids are making! We thank you in advance for the contributions that make these concerts possible. Each performer will donate $60; if there are two or members of the same family performing the donation is $100. Donations have to be received before December 16th. We invite parents, grandparents, friends, family members to enjoy the musical events at no charge. Supplemental donations also will be greatly appreciated and will help sustain programs at PACONY. Click here to view and download the full album of the concert. Performing Arts Conservatory of New York proudly presents the Winter Concerts 2016. The concerts will take place at the Renaissance Charter School in Jackson Heights, Sunday, December 11th, 2016. We look forward to seeing you all there and to presenting the musical progress the kids are making! We thank you in advance for the contributions that make these concerts possible. Each performer will donate $60; if there are two or members of the same family performing the donation is $100. Donations have to be received before December 10th. We invite parents, grandparents, friends, family members to enjoy the musical events at no charge. Supplemental donations also will be greatly appreciated and will help sustain programs at PACONY. Click on the image to view and download photos from our concert. Faculty member Julia Meynert, violin, and Nina Siniakova, piano, play works of Ravel, Grieg, Gershwin and Kreisler. Hear two fantastic musicians as they perform a program featuring classical elegance, romantic passion along with catchy jazz tunes. Tickets $30 general admissions, $15 seniors, $5 children. Buy your tickets online and save 25%. use code METISCONCERT to save 25%! Keiko Ueda, Voice, and J. Oliver Marin, Guitar play Holiday music at the Unity Church in Flushing, continuing the long running mutually beneficial relationship with the church and our school. Music by Gustav Holst, Francisco Tarrega, Irving Berlin, and others. Performing Arts Conservatory of New York proudly presents the Fall Halloween Concerts 2016. The concerts will take place at the Renaissance Charter School in Jackson Heights, Sunday, October 30th, 2016. Tickets will be available at the office of the Music School at $20 per person. Students performing will not be charged. We kindly request you to purchase tickets as soon as possible, but tickets will also be available at the door on the 30th. Students may wear costumes but it is not mandatory. We look forward to seeing you all there and to presenting the musical progress the kids are making! Click on the image to see the full album of this concert and download any pictures you would like. Photography by John Raymond and Maurice James. We look forward to seeing you at the concert. For more information please call 718-639-1425 or 917-772-3411. Nicholas Bentancur, pianist and student from the Performing Arts Conservatory of New York is performing this Sunday at Terraza 7. Nicholas will be performing works of piano by Bach, Beethoven, Chopin, and Moszkowski.